Cambridge University Press, 9780521856980, 786pp. Material properties emerge from phenomena on scales ranging from Angstroms to millimeters, and only a multiscale treatment can provide a complete understanding. Materials researchers must therefore understand fundamental concepts and techniques from different fields, and these are presented in a comprehensive and integrated fashion for the first time in this book. Incorporating continuum mechanics, quantum mechanics, statistical mechanics, atomistic simulations and multiscale techniques, the book explains many of the key theoretical ideas behind multiscale modeling. Classical topics are blended with new techniques to demonstrate the connections between different fields and highlight current research trends. Example applications drawn from modern research on the thermo-mechanical properties of crystalline solids are used as a unifying focus throughout the text. 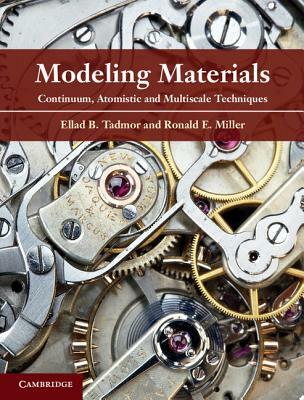 Together with its companion book, Continuum Mechanics and Thermodynamics (Cambridge University Press, 2011), this work presents the complete fundamentals of materials modeling for graduate students and researchers in physics, materials science, chemistry and engineering.